The more I go to Bolton’s Clandestine Cake Club the more there is to love- great people, baking camaraderie and, of course, cake. We met at Suzanna’s in Blackrod; a really lovely place with friendly and helpful staff which I must go back to for food soon. This month, organiser Rachel set us the theme sweets for my sweet and my fellow club members went all out. And what a lovely bunch. When I arrived my cake had bumped around in the car and bits had fallen off. Like true cakey comrades, about five ladies came to my assistance- and it was back in one piece in no time. These were seriously good cakes and all so different: liquorice and sherbet, pear drop bundt, fruit salad sponge, a giant walnut whip, strawberry jelly (jelly. In a cake. Weird but works! ), liquorice allsorts, honey, lemon sherbet. Just listing them is making my mouth water all over again. 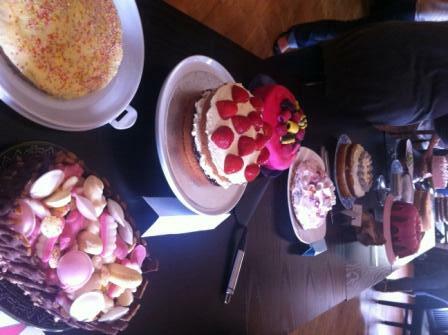 My cake was poetically called ‘an explosion on the Woolies pick n mix counter’! You can see all about it here. At a guess I would say that there were easily over 20 cakes, but I was so busy gabbing that I didn’t eat half as much as I normally do. On the up side, this meant that there was no sugar head ache when I got home! Next month the theme is Americana- I am already trying to come up with something. But, and I know I always say this, this was definitely the best month so far!